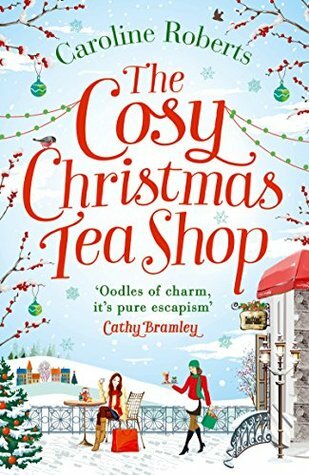 This month’s selection for the Tea Lovers’ Book Club, The Cosy Christmas Tea Shop by Caroline Roberts, wasn’t quite what I'd expected. The book was a bit edgier than I’d imagined, and it had some serious moments I didn't expect because of the book’s chick-lit cover, but overall I thought it was an enjoyable read. Summary: Fall is on the way, and castle tea shop proprietress and wedding caterer Ellie Hall is busy trying to drum up more business at Claverham Castle, which is owned by her curmudgeonly father-in-law, Lord Henry. The book begins as Ellie is faced with a real Bridezilla who has suddenly decided she’s intent on a unicorn-themed wedding. It sounds perfectly ghastly, but Ellie manages to make the best of it, pulls it off, and explores even more ways she and her husband, Joe, can help keep the cash flowing to the old castle. As Christmastime approaches, she and her staff decide to hold a Christmas fair at the castle, and the baking and entertaining ramp up once again—especially when there's a Christmas wedding for a favorite couple who’d experienced a near tragedy and had to rebook. My thoughts: While the author has a nice descriptive writing style, the book caused me to stumble at times because it contained so many grammar and punctuation errors and typos. I got the impression this was a book no one bothered to proofread, and that’s a shame, because the author clearly has the potential to be top-notch with some very basic cleanup of the text. 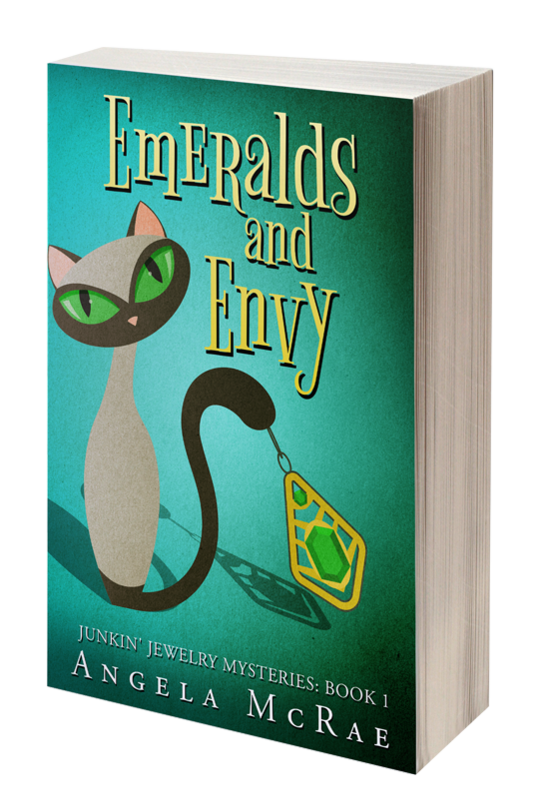 When I forced myself to focus on the story itself, I found the tale quite enjoyable. 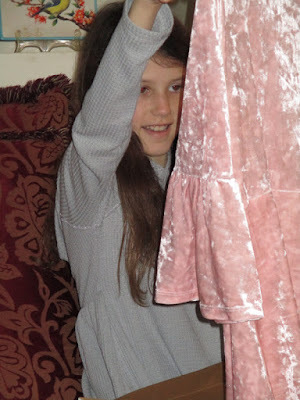 The characters: I very much enjoyed getting to know Ellie and Joe and found their relationship genuine and believable. I was surprised to see the early focus on their troubles getting pregnant, but that struck me as a very real plotline, and it didn’t overtake the coziness of the book. Of the other characters, one of my favorites ended up being cranky old Lord Henry, never more than when he got roped into performing as Father Christmas and was kind to a little girl with Down syndrome. Kindness—especially to children—scores you a lot of points in my book! Food. 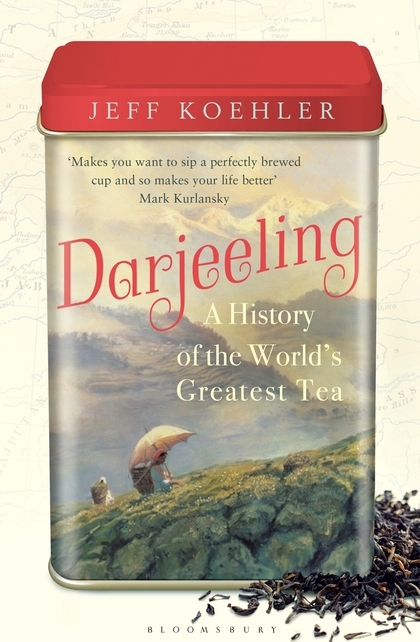 In a tea-themed book, I expect to see lots of great descriptions of the food and beverages, and this book did not disappoint in that regard. 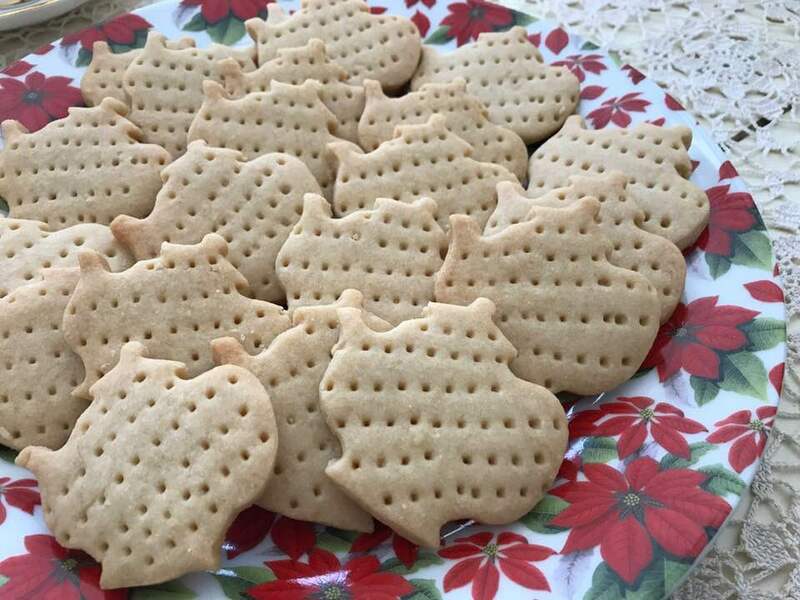 I was happy to see a few mentions of Garibaldi biscuits (or "cookies," to us) since one of my Christmas gifts was a British cookbook that has a recipe for them. 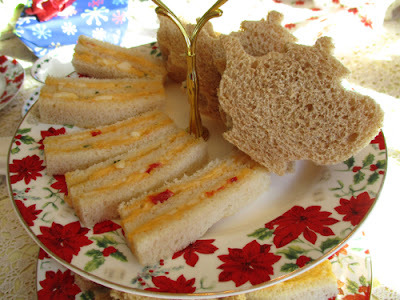 I also enjoyed reading about the stacked cake made of cheeses and thought this would be a wonderful treat to have at a wedding or other large social event. Do you like to read about the food in a book like this? UK differences. While reading a book by an author in the UK, I enjoy noting the differences in some of our terminology, such as the fact that they say "biscuit" instead of "cookie." 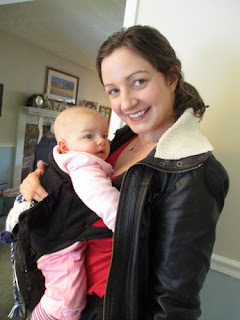 And I could not even type the title of this blog post without first typing "cozy" instead of "cosy." Did you note these differences? Did you enjoy spotting them? Sense of place. The author did a fine job of creating a real sense of place with the descriptions of the old castle and its advantages (history, beauty) and disadvantages (the wiring, the plumbing). When a deep snow falls right before an important wedding, I could truly picture the magnificent scene. Did you have a vivid picture of the setting in your mind? Our next book: Now that we’ve read two novels in a row, I think it’s time to go for some nonfiction, so I’ve selected Darjeeling: A History of the World's Greatest Tea by Jeff Koehler. 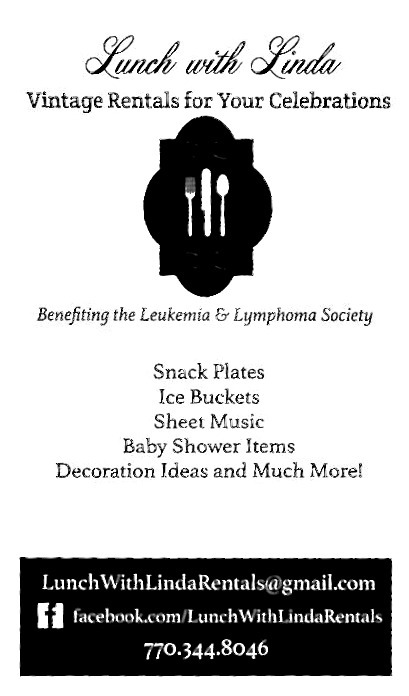 I'd love to have you read it and join in the discussion on Friday, January 26! Did you have a lovely Christmas, friends? I did. Alex and I particularly enjoyed the Christmas Eve candlelight service at our church. I love this time when the church is packed with worshippers sitting quietly as our college students lead us in songs and carols before we end by all singing "Silent Night" together in the dim light. After all the busyness of December, it's great to pause and reflect before Christmas actually arrives. And as the years roll on, I'm increasingly aware that second to the gift of Christ ("Thanks be unto God for his unspeakable gift! 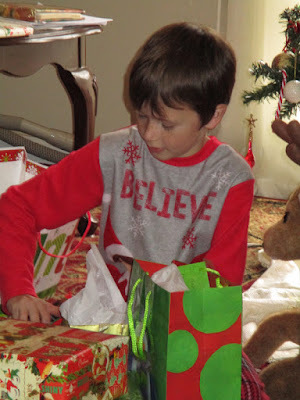 "), my favorite Christmas "gift" is simply having a healthy and happy family and friends. Here I am with Alex at my dad's house for the big family celebration on Monday. 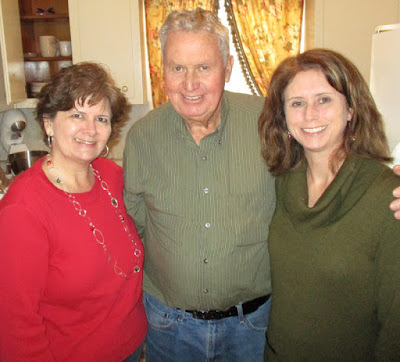 Here's my sister, Rhonda, and me with Daddy. Aunt Jane *loves* to have her picture made with Alex. And while I do enjoy receiving presents, I most enjoy giving them to all the kids in our family, so here are a few shots of my nephew and nieces, starting with the youngest, Matthew. Then there's Amelia, who received lots of clothes and horse-themed goodies for her room. Cari is an Auburn fan (sorry, Alabama friends) and had requested this T-shirt commemorating their win in this year's Iron Bowl. And Madison, the oldest, who now has her first "grown-up" job, has moved into a townhome with a girlfriend and had requested a coffeemaker. And we're still eating leftovers from yet another wonderful family meal! My sister and I join in for what we like to think of as a modified Thanksgiving menu. 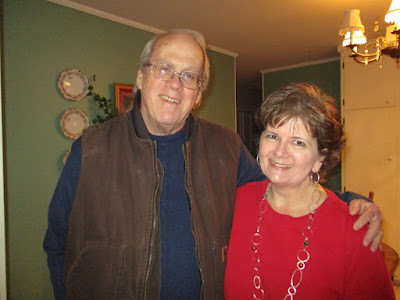 This year that meant a ham Daddy baked as well as dressing, sweet potato casserole, potato salad, broccoli casserole, green bean casserole, cranberry sauce, olives, and rolls. Dessert was a coconut cake, pound cake, chocolate chip pie, and pecan pie. All was accompanied by lots of sweet tea! I hope you had a wonderful Christmas and enjoyed a happy, healthy family celebration yourself. How did you celebrate? 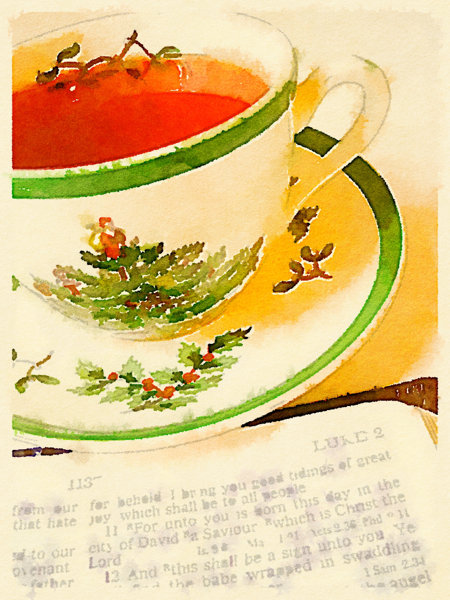 "For, behold, I bring you good tidings of great joy, which shall be to all people. For unto you is born this day in the city of David a Saviour, which is Christ the Lord." 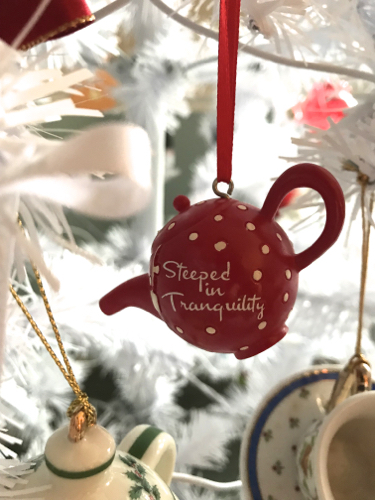 Christmas is just around the corner, and I realized I never shared any photos of my new white tea-themed Christmas tree. 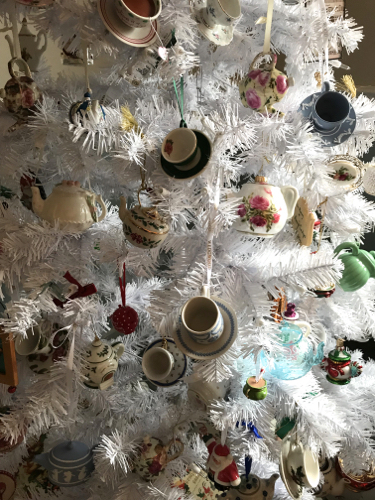 After buying a much taller tree than my little pink tabletop tree, I had assumed I wouldn't have enough teapot and teacup ornaments to decorate it, but it turns out that wasn't a problem! 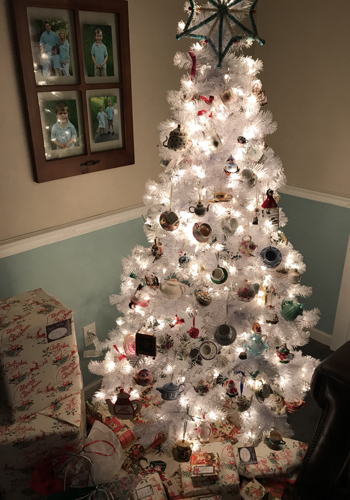 I have to say, the white background really seems to make the ornaments pop this year, and I love it. 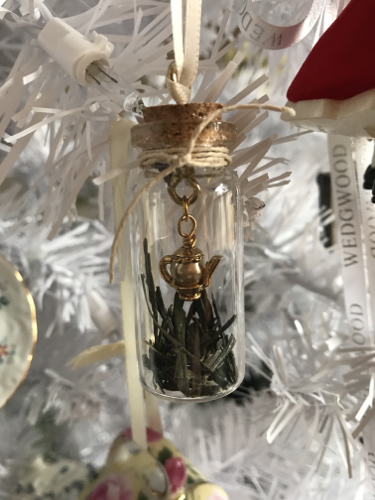 One of my newest additions is this handmade ornament from my tea blogger friend Lynn, the only ornament I've ever seen that actually contains real tea! Isn't this clever? 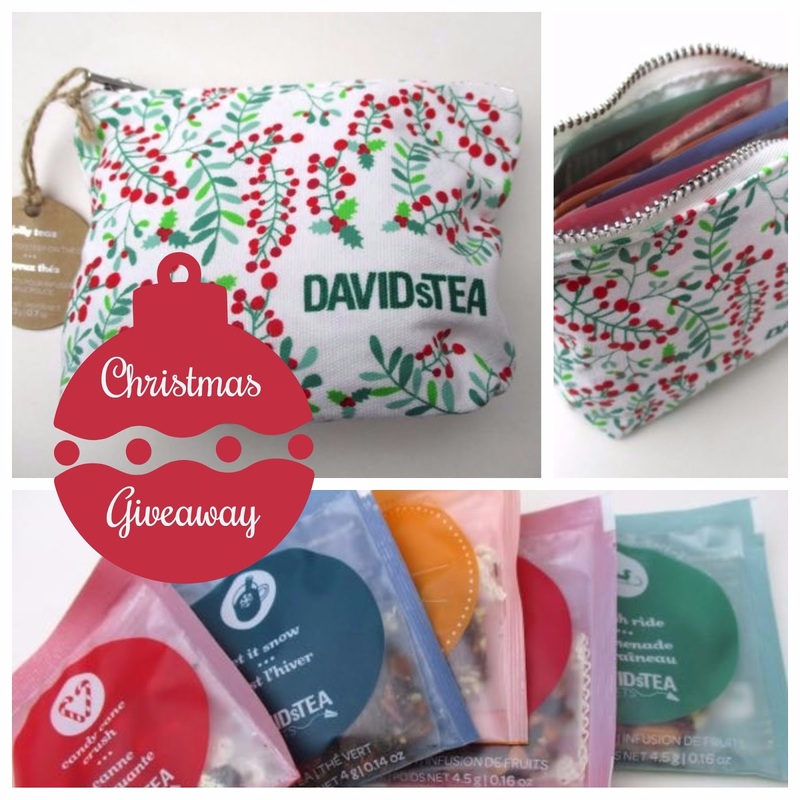 By the way, click on her name to visit her blog and get some great ideas for last-minute tea gifts. She's got some very creative ideas! 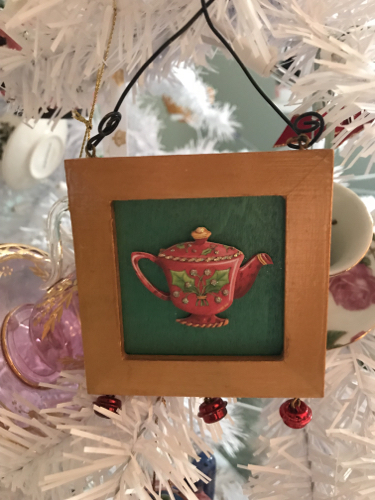 And below, I'll close with some other teapot and teacup ornaments that were gifts from friends in this lovely world of tea. Hope you all are getting ready to have a wonderful Christmas celebration with family, friends, and all those you love. Are you doing anything special this weekend? The thing I'm most looking forward to is the candlelight service at church on Christmas Eve. 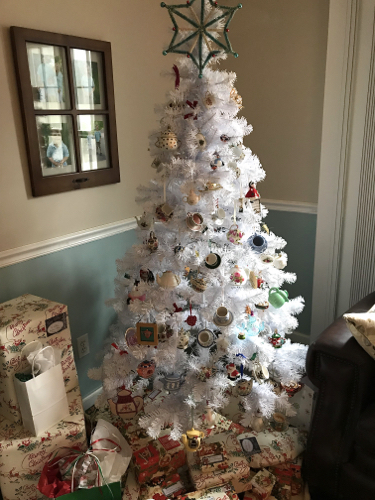 However you plan to celebrate, Merry Christmas, from my home to yours! 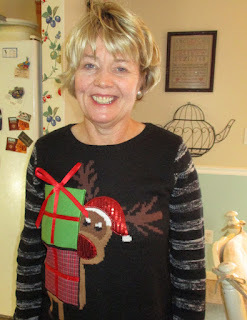 Karen O. of the Quilting, Losing and Tea blog! Congrats to Karen O., and thanks to all who entered. 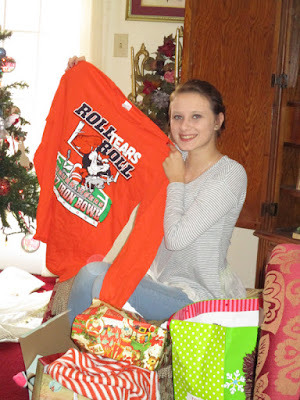 Looking forward to more fun giveaways in 2018! 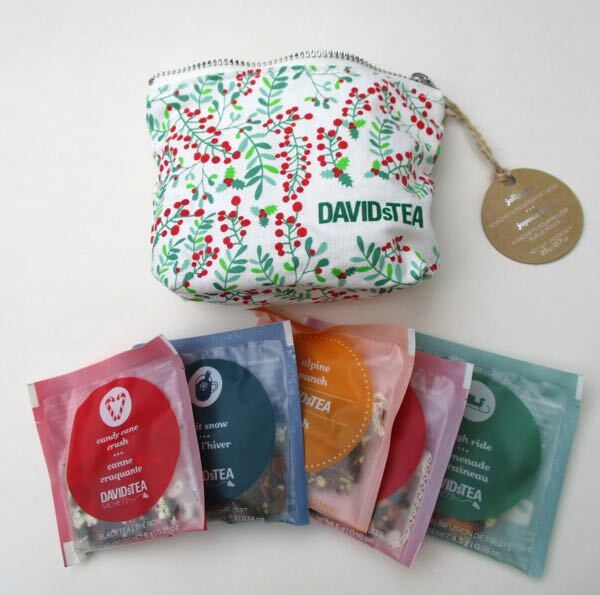 Peppermint teas are some of my favorites to try at the holidays, and I was intrigued by this one from Davids Tea, Candy Cane Crush. 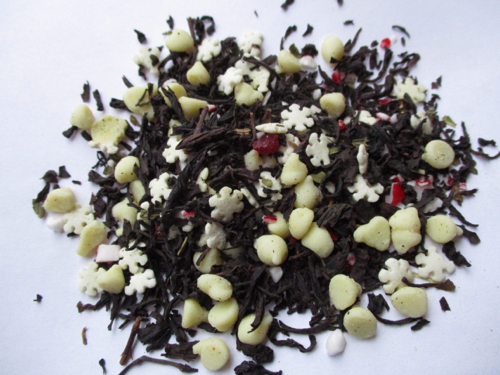 It's a creamy black tea flavored with white chocolate, peppermint bits, and snowflake sprinkles, so this is really like a cup of dessert! 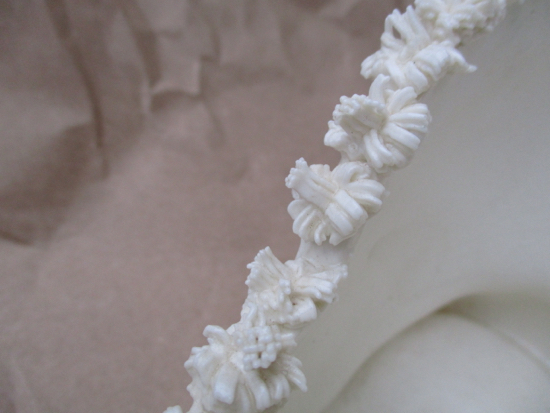 Here you can see that this tea gets a little milky looking as it steeps. 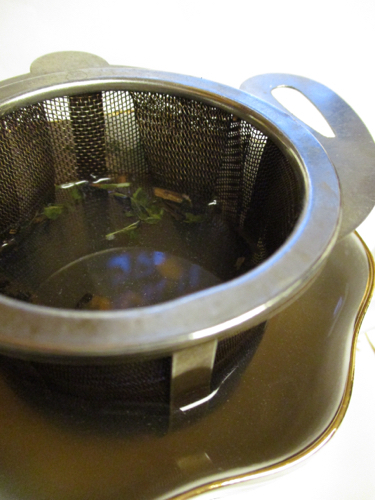 This was a delicious peppermint tea, made all the more enjoyable by the yummy bits of flavoring it contains! If you'd like to be entered to win, just leave an "Enter me" to this post between now and 7 a.m. Wednesday, Dec. 20, and please make sure I have a way to contact you if you're the winner so I can hurry up and get this in the mail! (US only, please.) Good luck, and Merry Christmas! Still, this frappuccino was quite yummy, especially since I absolutely love peppermint treats at this time of year. 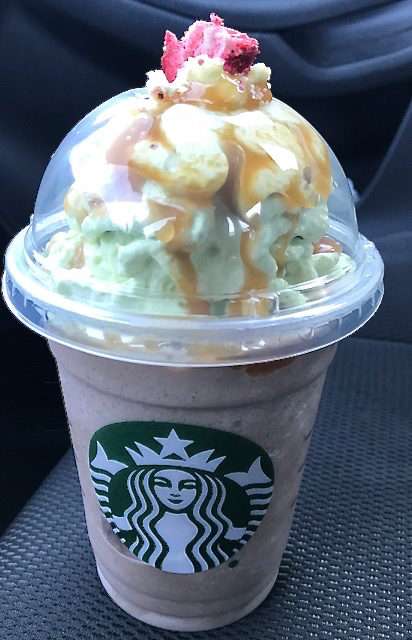 But matcha … in a Starbucks drink? Does that strike you as it does me, as somehow significant? We tea lovers have known about using tea as an ingredient for years, but it seems to me that the food world at large has now caught on to the trend. I typed "recipe with matcha" into Google, and up came more than 1 million results! I'm still not a real fan of matcha on its own, but I do enjoy cooking with it on occasion. Are you a matcha fan? 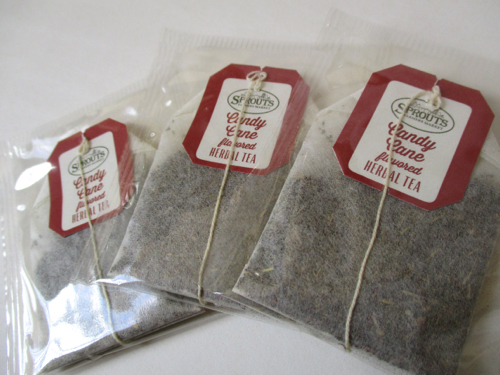 Over the weekend, Alex and I were in the Sprouts natural and organic grocery store in Peachtree City, where I browsed the teas and was disappointed not to see any Candy Cane Lane from Celestial Seasonings. Later in the store, we ran into an old colleague, Steve, and his wife, Robin, and I happened to mention my fruitless quest. 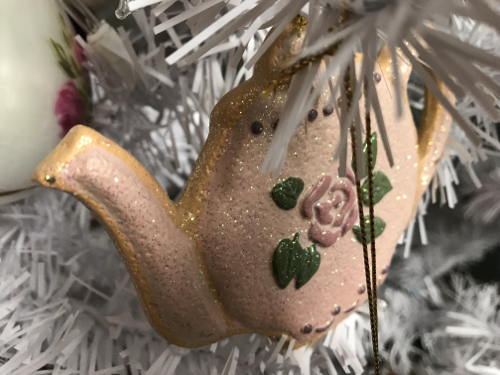 "I think I saw some candy cane tea over there," Robin said, pointing at a Christmas display in the store. 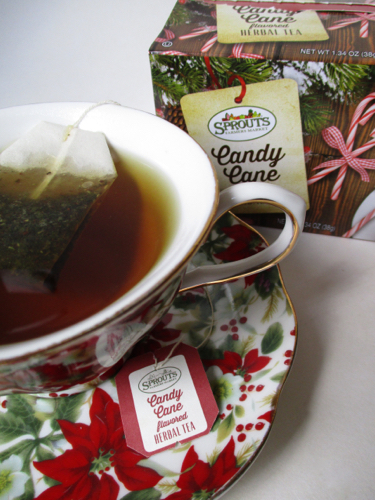 I rushed right over and found Sprouts's own candy cane-flavored tea, an herbal blend, and I must say it's a great substitute for Candy Cane Lane. It's got peppermint, cinnamon, spearmint, licorice root, roasted carob, natural flavors, and chicory, and it's delicious. 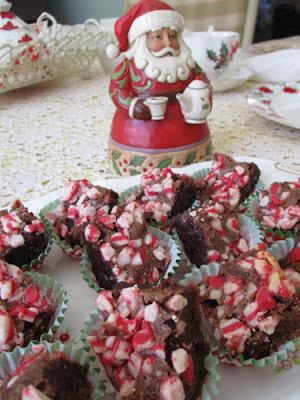 In fact, now I'm debating whether to order some Candy Cane Lane off Amazon or simply go back to Sprouts for more of this one since I bought only two boxes and am drinking it like crazy! It was only $2 a box, and I also love the fact the tea bags are individually wrapped. 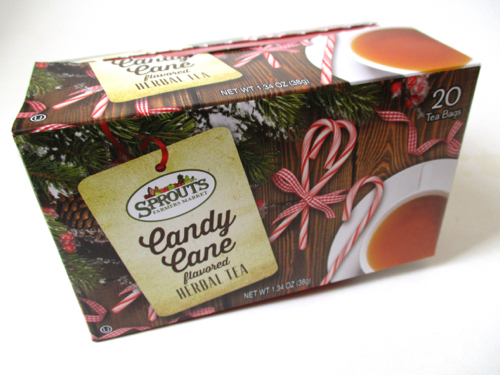 Have any of you tried Candy Cane tea from Sprouts? If so, what did you think? Two years ago, one of the best things possible happened. Our treadmill broke. 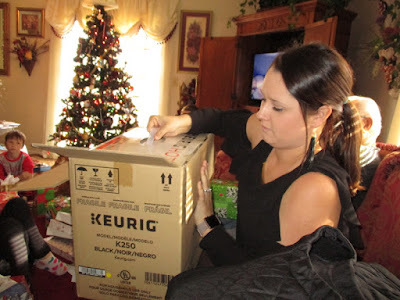 It was Christmas, so we didn't rush right out and buy a new one. 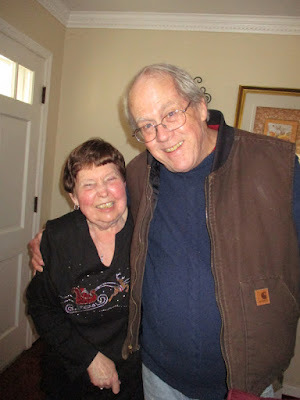 Instead, I started walking through the neighborhood on those cold afternoons, and I began to meet some of my neighbors I'd seen only in passing. 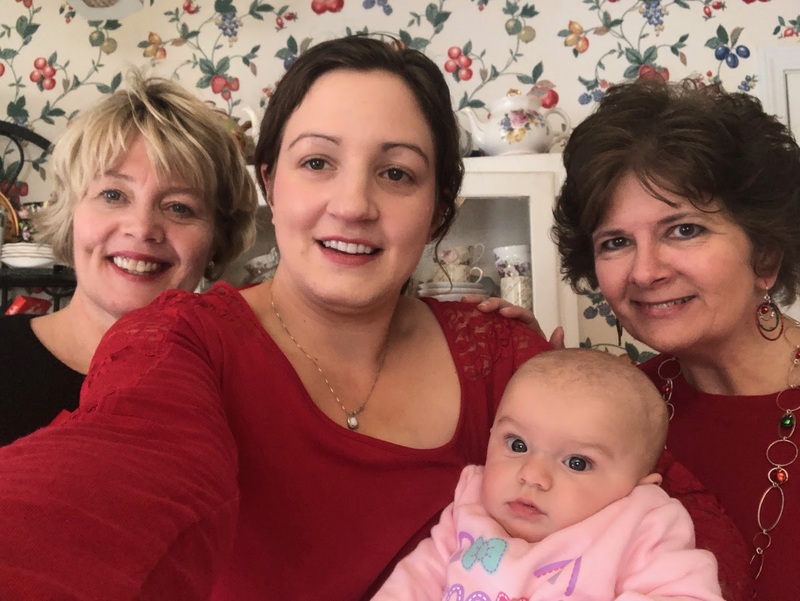 Today, I am so thankful for that broken treadmill, because it led me to two new friends, Carol and Amanda, and a third friend, Amanda's sweet little baby Kelly, has joined our group as well. Yesterday, I did something I'd been wanting to do for a while and had them over for Christmas tea! I must say, I love my neighbors and wish I'd gotten to know them sooner! Pimiento cheese ribbons and chicken salad sandwiches cut into teapot shapes. 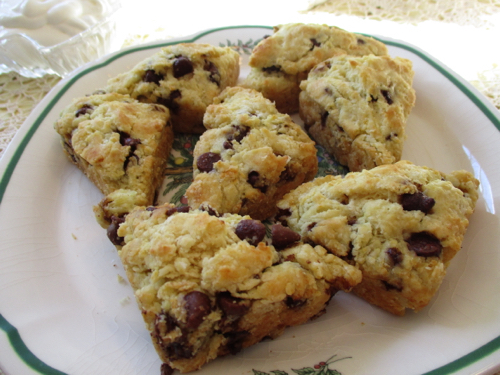 We had chocolate chip scones, and they were served with cream that I had in a Christmas tree–shaped dish (forgot to get a picture; y'all know how it is). And brown sugar shortbread (forever grateful that my pen pal Sandy shared this easy, never-fail recipe). 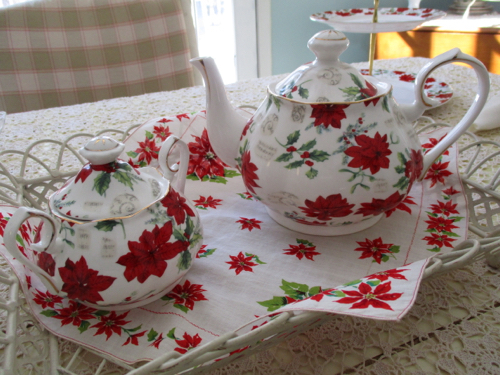 They matched the teapot and two-tiered server I already had, and Joy found me the sugar bowl as well. I think of her every time I see these! 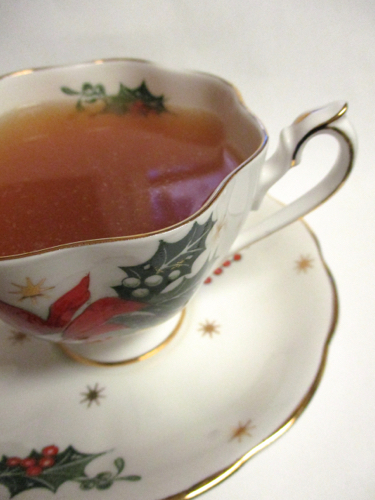 The teas I served were Victorian London Fog from Harney and Coconut Tea from Adagio. We drank many cups of each! And in some news I did not even mention on Friday because I doubted it would actually happen, we got snow here in Georgia! Several inches! 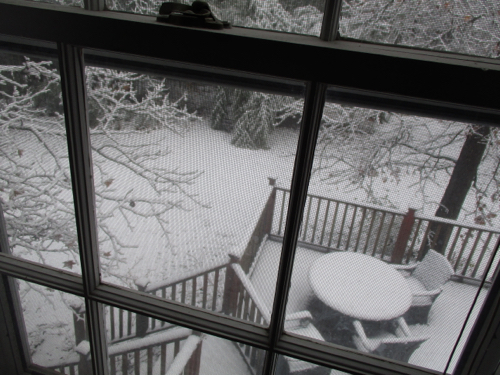 This snow-deprived child was quite happy to look out my office window yesterday morning and see … this view! 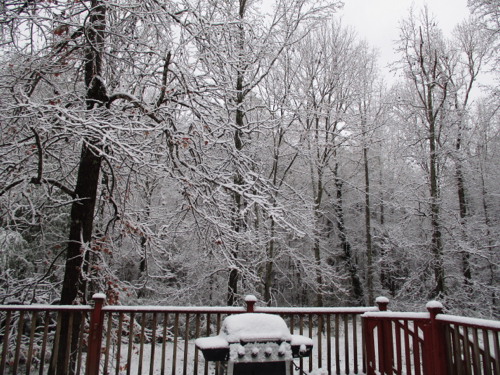 We rarely, rarely get snow in the South, and certainly not several inches of it, and when they predicted a dusting, I thought it was another case of the boy who cried wolf and didn't even take the forecasts seriously. Happily, the snow came at the perfect time, and I wasn't worried about it ruining my tea because my neighbors are close by. Most of it has already melted, and oh, how I envy those of you who are blessed with this beautiful white gift on a much more regular basis. It made an already fun weekend extra special! P.S. We did get a new treadmill, but I don't use it for fear I'll miss out on making a new friend. I'll stick to the roads! 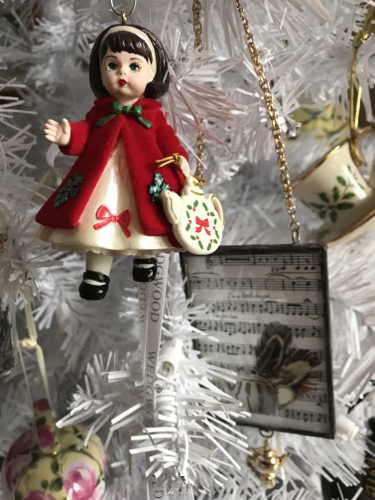 When Aunt Jane and I went in a Salvation Army store last week, I doubted I would find any good Christmas items at this time of year. 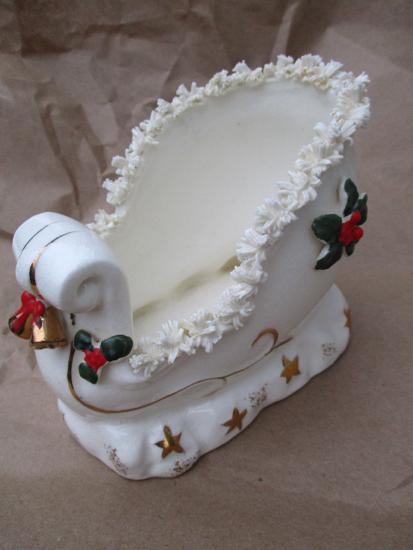 The good Christmas stuff gets gone early, but lo and behold, I came across two goodies that delighted me in both style and price, including this vintage sleigh, which I suspect will appear on my tea table this weekend. The sleigh features what I have learned is known as "spaghetti" trim. 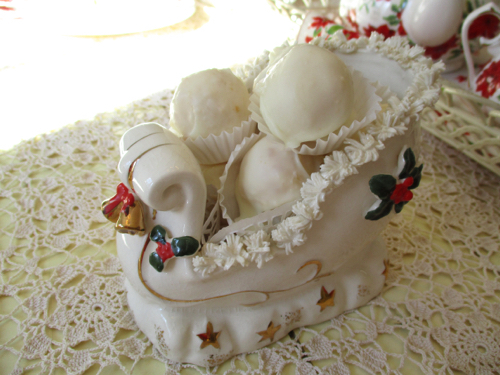 And what about the sweet bells? 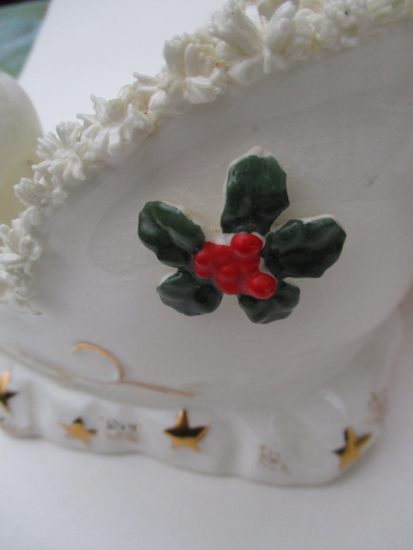 Or the holly? 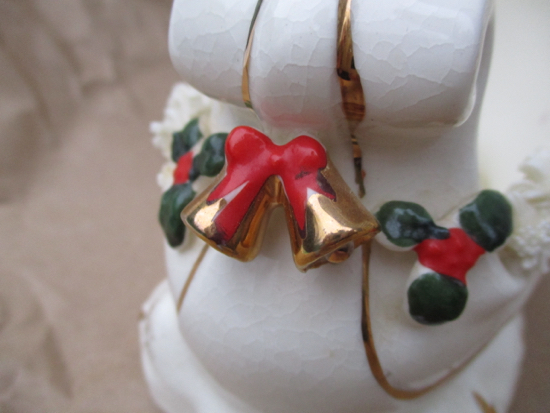 Could this piece BE any more Christmasy? Oh, and it has crackling. I love crackling. And all this beauty for 70 cents? I was quite happy! 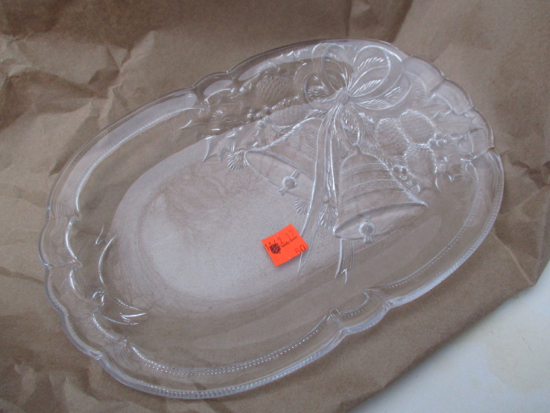 Then I found this pretty tray that I couldn't help noticing was exactly the right size for a loaf of tea bread. I thought the ribbon-and-bell design was pretty. 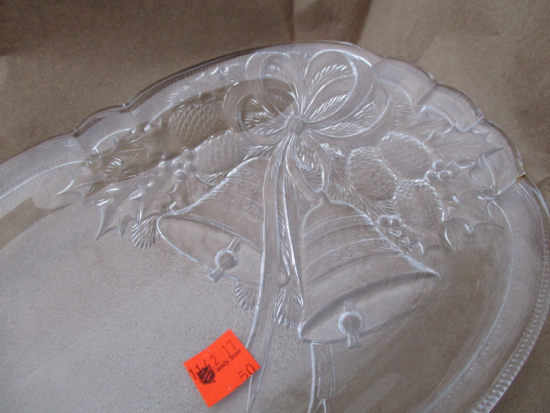 I was looking up a Mikasa pattern online and happened to discover that this crystal tray is by Mikasa, and if I wanted another just like it, I could get it from Amazon here. 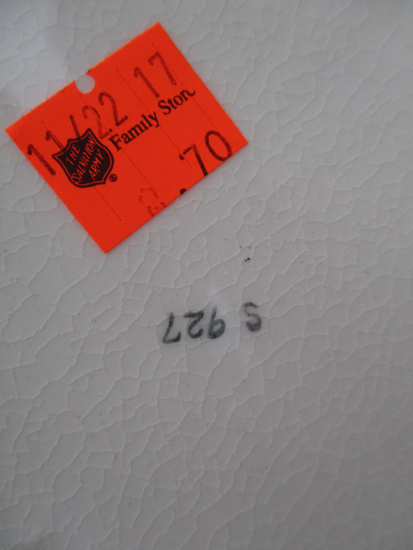 I like my price much better, don't you? As if all that weren't enough, the cashier directed my aunt and me to two overflowing carts, where a distributor had dropped off loaves of bread, English muffins, bagels, and other baked goods, and she told us to help ourselves for free! My whole-grain bread and cinnamon English muffins were one of the best gift-with-purchase deals I've ever gotten, and that made it some merry Christmas shopping indeed! I do believe Christmas magazines will always be some of my favorites, but I'm afraid I haven't come across very many new ones that tempted me this year. Vintage Holiday magazine was a treat with all its Shabby Chic and pink and vintage decor, but many of the others looked so similar, I usually left the newsstand empty-handed. 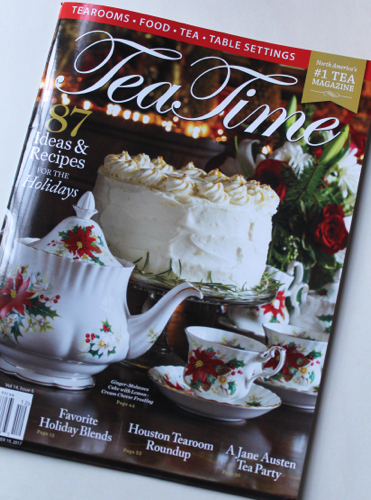 Thank goodness I knew I could count on the new issue of Tea Time for something pretty! 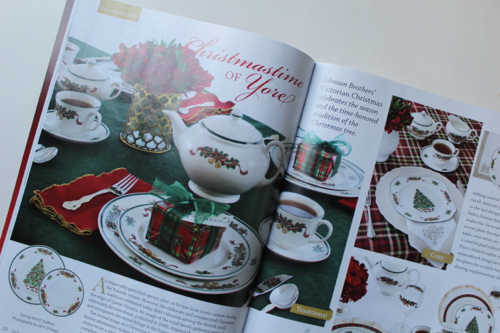 One of the things I most enjoy seeing in this magazine each year is all their pretty Christmas china. 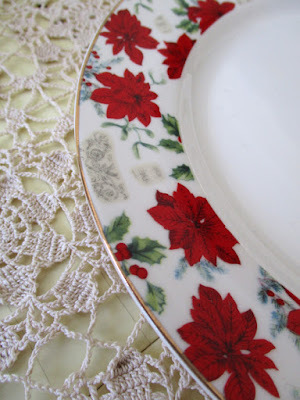 This Johnson Brothers Victorian Christmas is a pattern that was new to me, and it is quite lovely, and I love the plaid accents on this table as well. 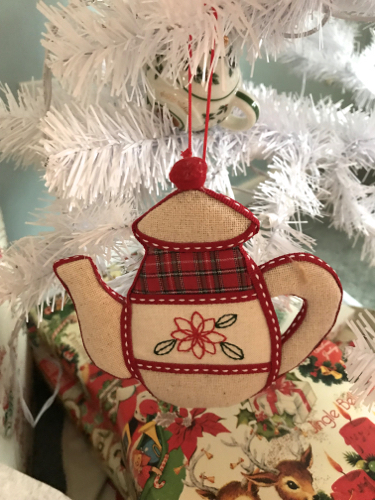 Something about Christmas plaid is always so elegant and classic looking. 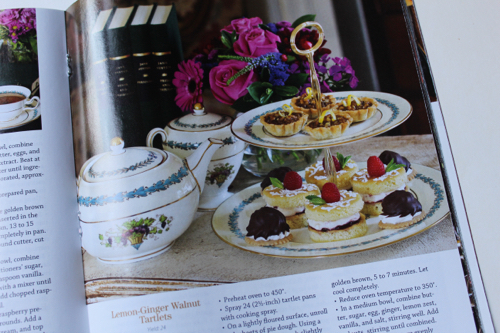 I was also inspired by this little two-tiered server with Lemon-Ginger Walnut Tartlets and miniature Victoria Sponge Cakes. I'm having two of my neighbors over for Christmas tea this weekend, and I really want to do something special for them. Lord willing, I will have Friday free to make a few things ahead, so I'm pondering what that might be. 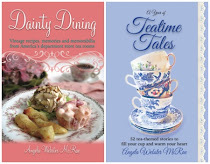 Not the tea sandwiches or the scones, obviously, but maybe some special cookies or truffles or tarts? 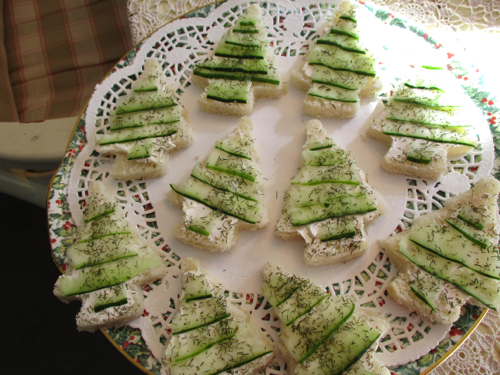 What would *you* find most tempting on a Christmas tea tray? Suggestions are most welcome!